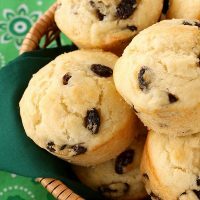 Irish Soda Bread Muffins – moist buttermilk muffins with raisins – are a great nod to Ireland plus uses up leftover buttermilk you may have sitting in your fridge. Every year around this time, I get a little “homesick” for Ireland. It’s hard to believe it’s been 7 years since I spent four months studying abroad in Limerick. It was my first time cooking for myself, which is how this blog got started. I miss walking to campus through what felt like a tunnel of green trees and feeling so tranquil. I miss walking to the abandoned castle off of campus and hanging out for the afternoon. I even miss walking 20-30 minutes one way to the grocery store. If there’s one thing I regret, I wish I had taken more pictures of the little details. Someday I hope to travel back and rent a car to really explore. Although that’s going to be fun trying to drive on the left side of the road with the driver’s side on the right side of the car (the passenger’s side). 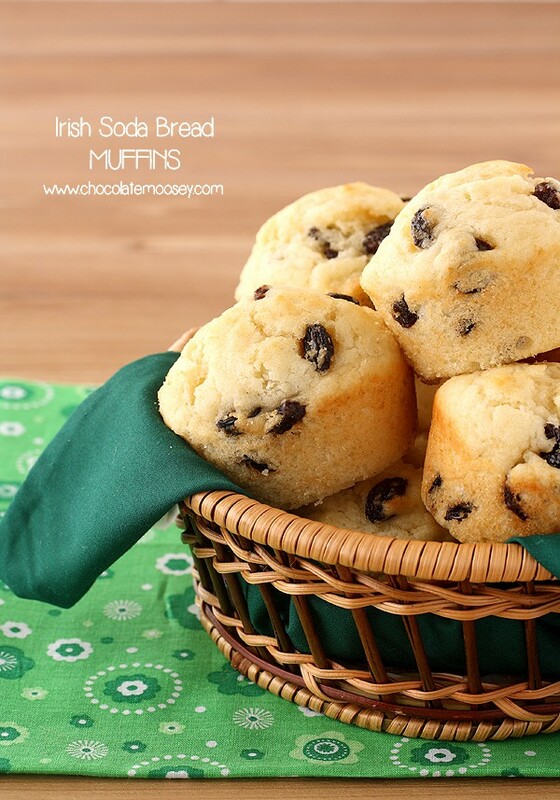 To help keep the memories of Ireland alive, I make Irish-inspired food, although these Irish Soda Bread Muffins are a bit of a stretch from traditional Irish soda bread. Whether you are purist or open to interpretation, I don’t think you can say no to these muffins. Now I know traditional soda bread is only flour, buttermilk, and baking soda. Even the raisins that I love adding aren’t technically traditional. 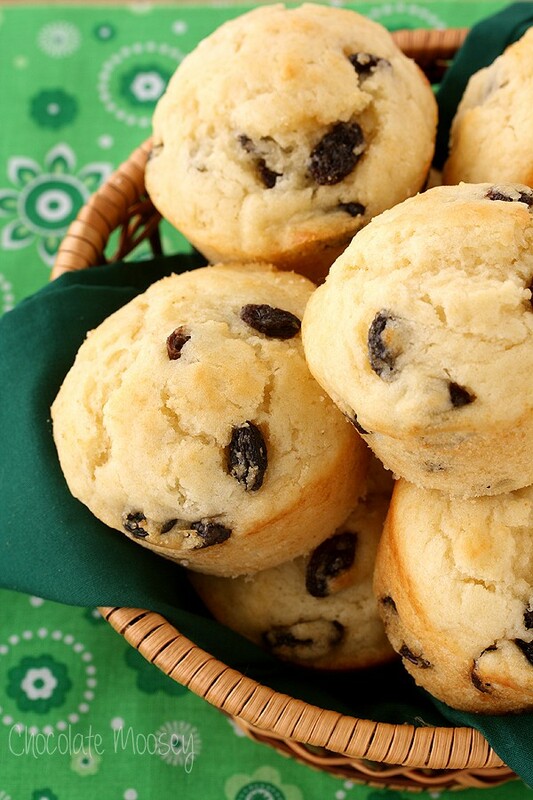 However, if you can look past that, these muffins make a great breakfast or snack. They aren’t too sweet except for the little bit of sugar sprinkled on top (which I forgot the first time I made them). The muffins are also more moist than soda bread, so no butter necessary. It doesn’t need to be St. Patrick’s Day either to make them. Make them for breakfast, brunch, snack, Mother’s Day, Father’s Day, Tuesday, Sunday, any day really. Got leftover buttermilk? This recipe will take care of it. Preheat oven to 400F. Grease a 12-cup muffin pan. In a large bowl, whisk together the flour, 1/2 cup sugar, baking powder, baking soda, and salt. In another large bowl, beat together the egg, buttermilk, melted butter, and oil. Gradually beat in the flour mixture until just moistened. Fold in the raisins. Fill each muffin cup about three-fourths full. Sprinkle the tops with the remaining 1 tablespoon sugar. Bake 15 minutes or until a toothpick inserted in the center comes out clean. Cool 5 minutes before removing from the pan. Serve warm or cool to room temperature. Store in an airtight container. 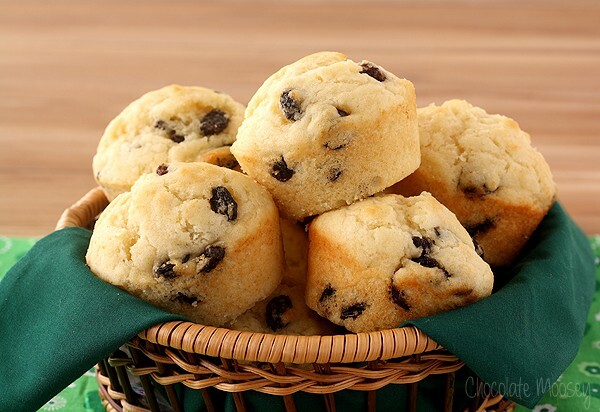 These muffins look so wonderful! How bright and cheerful. I’ve got buttermilk, but I’m in a three way dilemma about what to do with it. My kids love soaked-oat muffins. I want to stash some buttermilk pesto pizza dough in the freezer. And my son wants to learn to make ranch dressing. Oy! awwwwww I love reading you talk about Ireland-it sounds lovely :) as do these soda bread muffins! so cute and perfect for St. Paddy’s! I love the texture buttermilk gives, and this little way to remember your time in Ireland! What pretty muffins. Me too. Worth buying buttermilk for them. Love these muffins. Thank you. How wonderful to have spent that much time there. I love soda bread and always make it around St. Patrick’s Day (even though I’m not Irish) and then wonder why I don’t make it more often. I used to work with a woman who grew up in Ireland (even spoke with a brogue) and she gave me the recipe I still use and love. Same here. Seems like I forgot about it until I see green everywhere in stores! So there. I equate super friendly people who make me food and smile about it with the Irish. Ha! Loved this comment :) I’m half Italian with no Irish in me, but there’s plenty of Irish in my heart from when I was overseas. Waaaaah do not say it’s been 7 years!! so crazy! Looking forward to reunion 2015! Glad to hear it! Yea they a bit fluffier than what you’d expect soda bread to be (which is why I was hesitant in calling them that, but that’s what the original recipe called it). My mom loves soda bread and muffins. I have to share this recipe with her! I’d love to visit Ireland one day. I haven’t done much traveling in my life yet, but I’m sure I’ll get there someday. I always buy a litre of buttermilk and end up with tons leftover. I’ll print this recipe out so that I know what I’ll make next time that happens. These muffins look delicious! I love Irish Soda Bread – the sweet kind. I can’t wait to try your muffins.